Spain's acting prime minister, Mariano Rajoy, left, with Socialist party leader Pedro Sanchez before a meeting at the Moncloa Palace, Madrid, Spain, Dec. 23, 2015 (AP photo by Paul White). Spaniards went to the polls last Sunday to cap an electoral campaign dominated by the economy, corruption charges and a stand-off between Madrid and the separatist region of Catalonia. 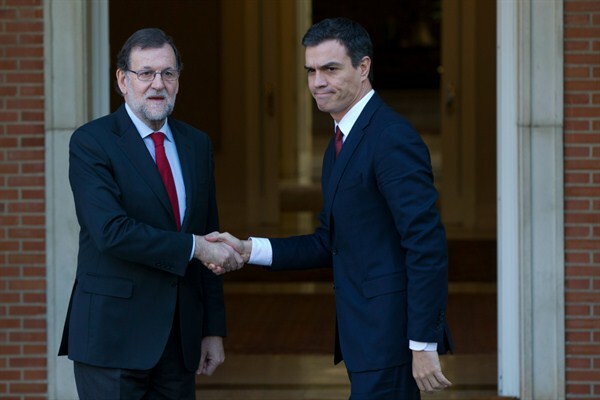 The results broadly confirmed what many had predicted: a win for the incumbent government of Mariano Rajoy of the conservative Popular Party (PP), but uncertainty over whether Rajoy will be able to form a government.